Thank you very much, zixacEPH. I must say I put some extraordinary effort to achieve a lofi techno-organic feel to the three newest MSX demos Riyadh, Alankomaat and Vesikauhu. Unfortunately, this seemed to go largely unnoticed at the time. Technically speaking these effects draw heavy inspiration from the quasi-3D effects of the mid-90's console games, stuff that in my opinion somehow looks fresh and refreshing even compared to modern 3D effects. I do feel much of my MSX demos were too rushed and as I said, they ended up getting none or very little feedback, but you're comments make the past days of my 8-bit coding feel a whole lot more worthwhile. Personally, I loved the scene with the birds. The cogs and pistons looked really good, too, but seemed a bit like householding compared to the more filmatic scenes. It certainly goes to prove that the MSX1 has a lot more potential than anyone knew. 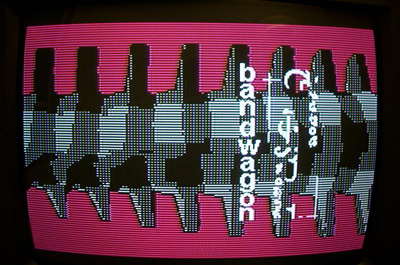 Probably my favourite Bandwagon demo, I really like the originality and the design. ace 8-bit demo.. routine in screenshot is cool and this actually has some style too ! One of the best MFX demos by bandwagon. some great effects and an odd concept: a mix of middle-eastern and industrial imagery. anyway, a great demo that should be watched by all msx fans. as i prefer 1x1 pixel feeling instead blurry video caps - what's best msx emulator for win? i tried bluemsx but it doesn't work well (f.e. first part of this demo looks different than on video). You could try either OpenMSX or the traditional fMSX. My guess is neither of them handles this 100% but could be close enough. Excellent demo. Great effects and nice music. The best Msx demo so far. Classic! A bit pretenteus, incoherent demo with couple of good screens and unimaginative music (but what can you do with a soundchip like that?). What's that hype all about? Added a .dsk version for emulators, it's indeed not a very interesting. Some people might like demos like that, I don't! :) Sleeping pill for me. great to watch and listen.. love the rough flair and 3dish scenes.. I mean wonderful (damn typos). This demo has lots of scenes very well designed. The 1st seen @ MSX platform! Technically nothing particularly special in my opinion, but I like the style in many parts. Remark :The link to an official video is no more working. Nice demo, but neither the first nor the last screen works properly on my Sony Hit Bit 75P MSX1. They pretty much quit. Some parts don't work properly with an MSX2 or the rare Toshiba VDP1. page created in 0.019853 seconds with 15 queries.